'Are Puli Hypoallergenic' Dog Breeds? Are Puli hypoallergenic dog breeds? That’s an important question to ask before you think about getting this unique dog if you have allergies! Keep reading to find out that answer and more about this great family dog! You may not know the name Puli Dog, but you’ll certainly remember the breed. If you’ve ever watched a dog show, and you saw a smallish herding dog that looks like a walking mop, you saw the Puli Dog. This guy is just one of several “mop” breeds, and today, we’re going to learn a lot more about him. Pulis are a strong-willed breed. You wouldn’t know it to look at them, but they require a metric ton of exercise, and their cute appearance belies a willingness to nip at strangers whom they deem hinky. Because this breed can be a bit deceiving in his appearance, we’re going to take a more in-depth look at this guy. Although the incarnation of the breed that we all know today is from Hungary, the real story of the breed is in Asia. Pulis came to Hungary with migrating Magyars from Central Asia. That version of the breed dates back 2,000 years, and there is even evidence to suggest the existence of a breed similar to the Puli Dog as far back as 6,000 years ago. These dogs were so good at their jobs that Hungarian shepherds would pay up to a year’s salary just to acquire one of these excellent herding animals to help them with their flocks. The Puli Dog looks like a walking mop. He sports a coat which naturally mats into long, corded “ropes” of fur. These lengths of matted fur help protect the breed from the elements, and in the past, from predators such as wolves and bears. These cords form from “controlled matting” in which owners separate the mats into smaller, corded mats. The corded coat of the Puli Dog is most commonly black but can also come in white, gray, or cream. Some cream coated dogs have black masks, and there is also a rare white version of the breed. This is due to a recessive gene. White Pulis are not albino. At an average of 17 inches at the withers and 35 pounds for the males and 16 inches at the withers and 25 pounds for the females, this is not an overly large breed. However, they have more than enough energy for dogs three times their size. The Puli Dog is intelligent and active. He’s a hard headed guy and requires adequate, early, and consistent training to avoid any dominance issues with his “pack.” Although hard headed, this breed is cozy and loving, especially towards children. Note that he is prone to sensitivity and resentment, so always use positive reinforcement (which is all you should use anyway). The Puli is a herding dog with strong guarding tendencies, so it’s important to address that with lots of socialization. While he loves his family, he can be quite standoffish with strangers, and he’s more than willing to nip or even get a piece of anyone or anything that he deems a danger to his flock (family). Because of this strong guarding instinct, it is absolutely vital to socialize your Puli Dog early and vigorously. Introduce him to tons of new people and places. Let him meet other dogs, cats, rodents, whatever. Teach him that the world is not something to defend the family from at all times. The Puli Dog is a hardy guy, with a lifespan averaging around 16 years. He is generally in good health and is only more prone to a few issues. Even those are not life threatening. Hip Dysplasia – A condition in which the head of the femur doesn’t seat correctly into the joint of the femur. Mild cases may require little to no treatment while severe cases can require surgery. Progressive Retinal Atrophy (PRA) – A progressive, degenerative disorder which leads to loss of vision and eventual blindness. Cataracts – An opacity of the lens of the eye that can result in loss of vision. This is rarely an issue because cataracts rarely from in a dog’s eye before old age has already long set in. The Puli Dog does for city life. In fact, he does best as an outdoor dog. Although this may seem cruel to some, remember the origin of this breed. His roots are as a roaming herding dog. He wants to run and range, so his ideal home is in a rural setting which allows him to range in a relatively safe environment consisting of very little car traffic. A home with acreage would be ideal. If the Puli does end up in a city home, a fenced backyard is absolutely required. This breed is 100% NOT a lounging lap dog. In fact, when he’s cooped up for too long, he can become quite destructive. A couple of walks won’t cut it for this guy. He’ll need lots of outdoor time and in the absence of the ability to roam all day, at least three vigorous walks. Jogs are even better. Here’s where we answer that big question of “are Puli hypoallergenic?”After the initial “ripping” of the mats on the coat to ensure proper roping, there is little grooming to be done with the Puli Dog. Because those matted cords are a desired trait, there is no required brushing and even bathing is an infrequent thing. 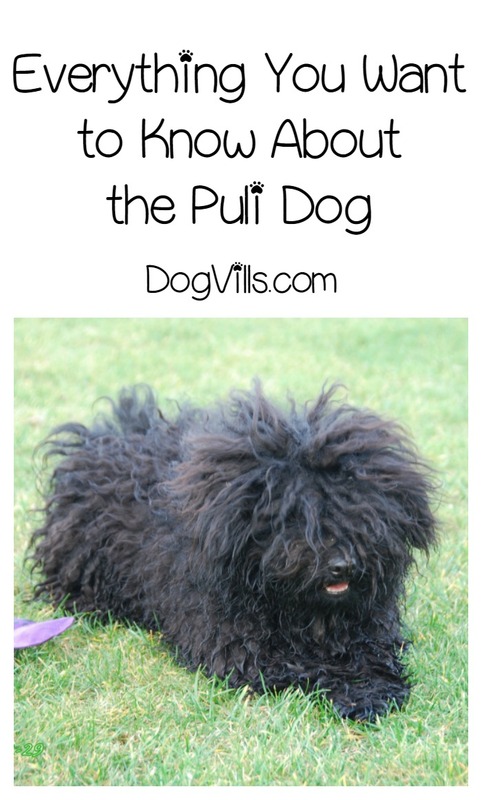 Since the Puli doesn’t shed, it makes a great hypoallergenic dog breed. The Puli Dog is an excellent addition to a family with experience in training dogs. This is not the breed for a first-time owner by any stretch of the imagination. In fact, first-time owners will more than likely find themselves being run by their Puli Dog. If you have the time to spend on training and exercise – and preferably acreage – the Puli Dog could make a great addition to your family. As always, make adoption your first option. You will almost certainly never find a Puli Dog in any shelter anywhere. However, there are tons of breed specific rescue sites online. You could probably find a Puli Dog rescue site. These sites make it possible for people to find a particular breed while still helping a dog who needs a forever home. Who knows. You might just find the perfect match. Do you have one of these hypoallergenic dog breeds? What do you love about the Puli?